Abracadabra Leaflet Distribution offers reliable GPS tracked leaflet distribution Sandhurst GU47. We use the latest GPS tracking technology for all of our leaflet distributions and whether you need us to help you with all or just part of your distribution needs, we will work as a team to help you get the job done in a professional and cost-effective way. Even if you have no idea at all where you want to start with your leaflet delivery campaign, our in-house design team will help you get the most from your direct mail marketing using specialist software and state-of-the art technology. Of course, our exceptional leaflet distribution service wouldn’t be complete without giving you the unique opportunity to get incredibly low prices on your printing! Get a discount on your leaflet delivery when you order both your leaflet printing and distribution from us. To give you added peace of mind, we also take pride in following the code of practice as laid out by the Leaflet Distribution Organisation (LDO). But don’t just take our word for it – see what our clients have to say about us by visiting our testimonials page! FREE report and map on the GPS tracked leaflet delivery,so you can view the exact route the leaflet delivery person took to deliver your leaflets, as seen in the above image. Discount on our special design, print and distribution packages. FREE town specific demographic information through our geoplan software, as shown in the example image below. Sandhurst is a small town, primarily domiciliary in nature with a few light industries. 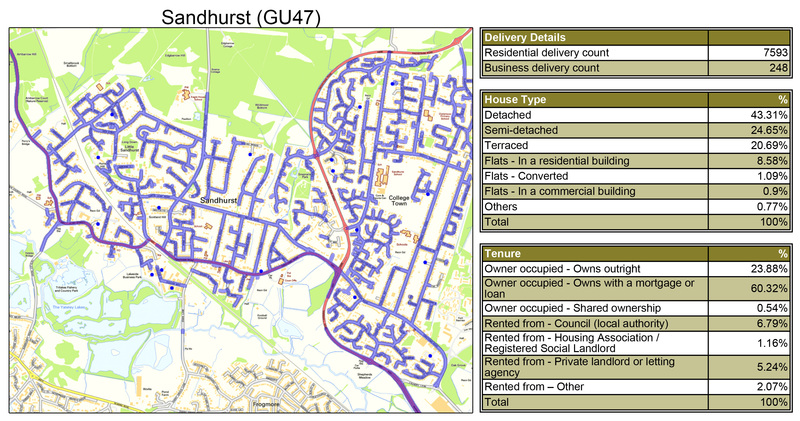 With Abracadabra Leaflet Distribution Sandhurst, we can cover the majority of areas within GU47. We also provide leaflet distribution in Ascot, Bracknell, Camberley, Caversham, Farnham, Maidenhead, Newbury, Basingstoke, Reading, Windsor, Winnersh and Wokingham.